Views & opinions expressed on girlheartfood.com are those of the blogger and are just that, views & opinions. 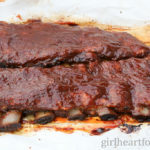 They are from the personal experience of the blogger at girlheartfood.com. I cook for my own enjoyment and entertainment. I’m not a professional cook/chef/baker/dietitian/nutritionist/medical expert or offering any kind of professional advice. Following any advice provided on this Website is at your own risk. Under no circumstances will I be held liable for any loss or damage arising from the use of this Website. No warranty implied. I make no representation as to the accuracy or completeness of any information found on this Website, including the information contained in the outbound links (websites) I point you to. Users/readers should verify any information regarding products/services & the like themselves should they wish. We may receive information about you from other sources. For instance, if you use a third party service provider through the site, they may transfer information to us for fulfillment. Like many websites, girlheartfood.com uses information from log data which may include information such as the Internet Protocol (IP) address of a visitor’s computer, as well as the browser type, browser version, the pages of this site that have been viewed by the visitor, the time and date of the visit, the time spent on those pagers and other statistics. While this data is used to track visitors’ behavior, it is not linked to any information that allows this Website to personally identify the visitor. If you decline cookies in your browser, please note, this may result in all functions on this website not working properly. For more information about cookies, you can visit https://www.aboutcookies.org/. Additionally, the Website may use third-party service providers to service various aspects of the Website. Each third-party service provider’s use of your personal information is dictated by their respective privacy policies. We do not authorize them to use or disclose your personal information except in connection with providing their services. These service providers may have access to your personal information or other information in order to provide these functions. In addition, some of the information we request may be collected by third party providers on our behalf. This Website currently uses the following third-party service providers. MonsterInsights – this third-party service provider allows this Website to manage its Google Analytics. This third-party service provider syncs with Google Analytics. It tracks Website usage, browser information and may capture your IP address. However, this Website has activated the option to anonymize IP addresses. VaultPress – this third party service provider backs up this Website and provides security scanning. WPopt – this third party service provider provides the web hosting for this Website. Please note, this list may be amended from time to time at the Website’s sold discretion. Opt out of Facebook retargeting Ads here. Opt out of Google retargeting ads here. If you are subscribed to our newsletter, you may unsubscribe at any time should you wish to do so by following the unsubscribe links in our emails. Also, you may notify us at [email protected]to be removed from our mailing list. This Website is a fun website with recipes, chit chat &/or food-related topics. It is totally awesome when visitors/users make comments which allow for fun, positive interaction. However, please note that this Website reserves the right to not publish or delete comments which are negative or inappropriate. Please be kind. Any comments posted on this Website become the property of this Website and may be used in this blog (Website), e-mails, or products and/promotion of this Website or the Girl Heart Food brand. Moreover, any comments readers leave on this Website are public and may be read, collected or used by anyone. Your name, website (if applicable) and date/time of comment will be displayed. However, your e-mail address and IP address will be secure. Readers accept these risks when providing personal information and posting comments to this Website. Our Website is not directed to children under 16. We do not knowingly collect any personally identifiable information from children under the age of 16. If you learn that your child has provided us with personal information without your consent, please contact us at [email protected] and we will use our best efforts to promptly remove such information from our records. Are hosted with the intent of adding fun to this Website and in no way are meant to be a form of gambling. Open only to residents of Canada and U.S., unless otherwise stated. Start and end on dates of the giveaway will be listed on each specific contest. If giveaway is self-hosted the prize will be mailed to the winner(s) within 14 days. Please note that this Website chooses the companies that we work with very carefully and only choose companies that we think are reputable and honest. If a giveaway is sponsored by one of these outside companies or businesses, this Website cannot be held liable or responsible, should a vendor choose not to fulfill a promised prize. Once winner is randomly chosen, they will be contacted via the e-mail address they provided upon entering the contest. In order to send the prize to the winner, we may require a mailing address. Winner recognizes that their information (name, e-mail address and/or mailing address) may need to be passed onto the prize delivering party for fulfillment of the giveaway should the prize be sponsored by an outside entity. We may, at our discretion, make public the first name and province or state of our giveaway winner(s). All other contact information will remain private. Each winner will have 48 hours to claim the prize, after being notified via the e-mail they used to enter the contest. After 48 hours, if there is no response (or winner does not meet entry requirements (as specified when they entered), another winner will be randomly chosen. All giveaway entrants agree to be honest and not cheat the systems; any suspect of fraud is decided upon by this Website and/or the sponsor, and entrants may be disqualified at our discretion. We are not responsible for lots or damaged items. Replacement items will not be provided. Giveaways may be promoted on Facebook, Twitter, e-mail or other social network sites. This is a means of promotion only, and any promotion on those sites is not to be interpreted as Facebook or Twitter partaking in, or being in any way responsible for that particular contest.